This is the first page spread inside the tagbook. Each of these little spreads took me hours...well, really days. I would build a lay-out and leave it unattached for awhile, come back to it, think of something else to do, drop some trinket or paper scrap into the muffin tin, come back later and change it once more. Knowing it was for the magazine made me want perfection which is not my usual M O (pun intended). One of my struggles was how to organize the progression of pages. I decided to treat them like chapters with the tags being little pages within. The editors wanted a patriotic/summer theme which meant some red/white/blue. 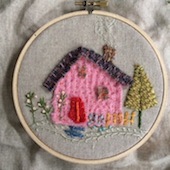 I was free to choose other colors and if I went with her story, I could begin with the pink house. We lived in our yummy pink house in Oak Park, Illinois for 14 years. Blue when we arrived as a family of four, the pink paint job was a brave change in the 80's - the neighbors weren't fans for a few years. 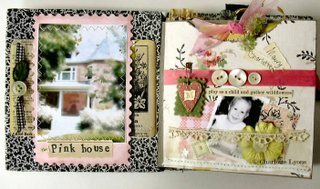 Adorable clapboard Victorian with a turret, Andy's handmade kitchen, big studio/playroom, huge porch, backyard playhouse (pink! ), cottage perennial garden, kids up and down the block, best friends across the street and around the corner, a quilting group, a Wednesday diner lunch group, farmer's market with a bluegrass band and homemade donuts, no end of amazing tag and church sales, great village, incredible schools, parks and rec centers, diverse community, historic architecture -- and 20 minutes west of the Chicago Loop and lakefront. Many happy days there with Erin and Maggie before Mo was born, but I know they'd be the first to say that she brought lots of sparkle and joy to all of us. So that is where I began (and could have stayed for the whole book). Almost everything I used was recycled from my collection of scraps and bits. I rarely shop (would mean leaving the neighborhood) and like to use the things all around me. Essentials are cardstock, edgers and adhesives. The page left side has a U-shaped paper lift for a slider tag behind the picture of the house. Fooling around with a scan of the old snapshot of the house, the computer's art effects buttons created a painterly look -- those bridal veil hedges really did look like springtime snow banks. Finished and mounted to cardstock backing, I stitched around it, edged it and attached it to the paper lift. See what I meant about the b/w composition pattern? If you are adding type anywhere, it works well with that too. To the cardstock slider tag I added some zigzag stitching and a pull button/ribbon. 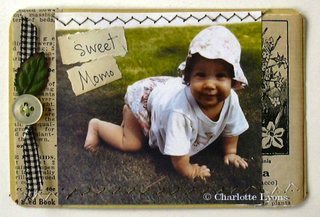 Love, love that crawling babe in her bloomers and flower hat! 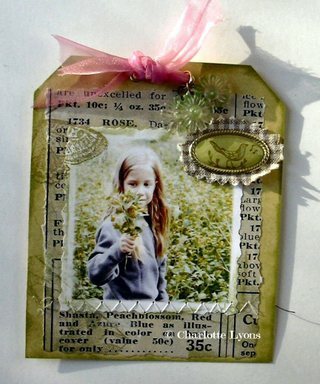 On the other side of the layout, the semi-transparent pocket made from a strip of organdy ribbon (saved from a floral delivery) created a place to slip some small tokens...a baby pic, the number 3, a little vintage star, flower, lace. Note- sew the ribbon pocket onto the paper panel before attaching the panel to the page. The text and writing are on paper snipped out of book margins, the aged ivory color so nice with the rosy pink seam tape. Making the felt heart plaque was hard on the eyes and fingers, but love that bit of handstitching. Something about that baby pin touches me too. 3 pearly buttons for the 3 sisters. And yes, her real name is Charlotte Maury- immediately shortened to Maury and then about age 10 it became Mo. The soccer coaches loved that, so yell-able, and now everyone calls her that -- we like Momo. The tag inside the pocket needs a sturdy pull on it. Eyelets as reinforcers are a must and 2 of them make a perfect place to lace some kind of ribbon or textile. Hang some charms...or here, a deconstructed earring. Love my friend Brenda's beautiful bird charm plaque. Layered onto the homespun textile, it kind of says it all for me. Then just more stitching and stamping. And that sweetpea with her bouquet of weeds. They could have been wildflowers! You can bet I put them in water and on the table. Can't help wondering if anyone is reading this...should I continue or you've heard/seen enough? Should I go back to felt? Do let me know. Oh is it so wonderful! Your selection of colors is perfect. Love Brenda's bird charm, too. I tend to do the same thing you do: lay it out and walk away and come back later. Totally hear you on that one! And on the perfection for the big girls complex. Makes it so much harder! But, it looks great and do show us more! Mix your felt way with your new paper ways....see what happens! Thank you so much for visiting my blog; I really appreciate your comments. Mothers & Daughters at Home and Between Friends are my most valued craft books ~ besides having made many of the craft projects, I love to just sit and read the stories you've included about yourself and other crafters. Thanks for all the how-to's on the tag book; the zigzag stitching is a great idea. I would love to make one for each of my kids~yours turned out fabulous! This has been your best post yet Charlotte! 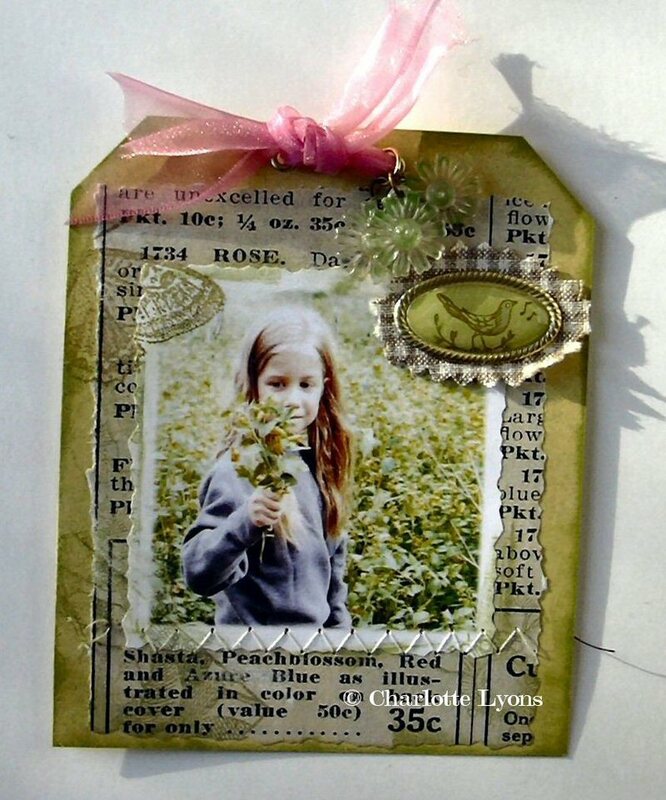 My favorite kind of post is one that includes part of a person's personal story as well as craft. I loved seeing and hearing about the pink house. This book is wonderful and I enjoy hearing about the process and seeing the details close up. Can't wait to see more. I always have lots of projects laying around while I just "look" at them. It's probably why I'm so slow to finish things. I hope you will continue! I'm listening and am thrilled with your ideas and instructions. I've been following your work for years through ME Home Companion, and your two wonderful books! I'm a mom in a New Orleans suburb who loves to craft and am inspired by your beautiful things! Thanks! Beth W.
You should continue! This is wonderful. I never saw that pink house when I visited Oak Park :-) Was it still pink then in 1997? this is beautiful and I for one would love to see more. of course, if you go back to felt that would be lovely too...I adore the little felt heart in the first picture! Don't stop....what a lovely little book! I want to see more! This is an absolutely beautiful book of memories. Such a sweet book. I love the bird charm plaque and the story behind your daughters name! Thank you for sharing this. It is absolutely gorgeous. I love the pink house!